What child doesn’t love pies and pastries from a wonderful shop called Puddin Hill? For Casey Copeland, those stops on the road to Texarkana from Dallas paved the way for a culinary career. But he never considered cooking as a career until he saw a late-night commercial for Le Cordon Bleu. Soon he was headed to Austin, Texas to study at Austin Culinary Academy Le Cordon Bleu. “The minute I got there I knew it was where I was supposed to be,” Copeland said with a broad smile. After graduation, a culinary school friend helped him get a job at 42 Bar & Table at the Clinton Library as a line cook, sous chef and, eventually, catering supervisor. This allowed him to gain a variety of valuable experience with multiple events. His next opportunity came at Little Rock’s Pleasant Valley Country Club as sous chef, and later as its executive chef for several years. Copeland’s continued search for growth and experience pulled him to the fine dining establishments of Dallas and Little Rock where signature dishes built on authentic and local flavors were the standard. 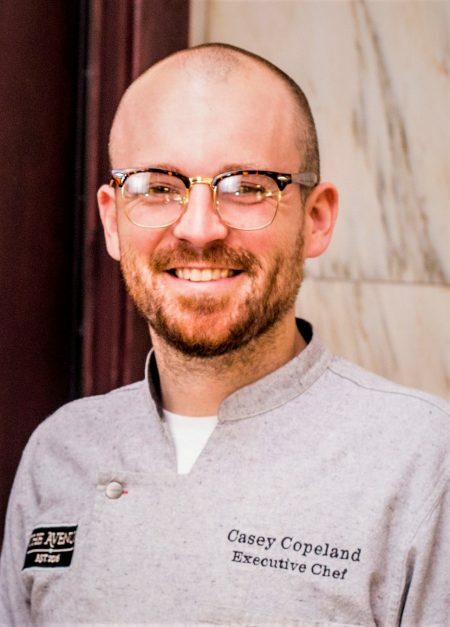 Before coming to The Avenue, Copeland was executive chef at the renowned SO restaurant in Little Rock where he was made an impression on patrons, food writers and the industry.